If you've been following the past few weeks, you'll see that we've been getting ready for Winterfest on Saturday. We're super-excited to try beer from Tyranena, 75th Street, and Rust Belt and we hope that they will become regular fixtures in the Indiana market. I am also anticipating this event's Replicale (a coffee-oatmeal beer) quite a bit (big surprise if you know me, I know!). I hope you have your tickets already (no online tickets are left, but there may still be some at any of the locations listed here. We hope you'll say hello if you are there. Friday, February 26th at New Albanian Public House in New Albany: Gravity Head begins! Saturday, March 6th: KOTBR100 Bus Trip to New Albany - Tickets are available NOW! On tap now is “The Hammer”, a Baltic Porter weighing in at 8.7%abv, and Hop Bomb is back and better than ever! Can’t wait for Winterfest!! The crew at Lafayette Brewing is eagerly anticipating this weekend's Winterfest. Look for our booth OUTSIDE on the patio along with the cask-conditioned beers and The Malt Shoppe station by WCB. We'll be serving a trio of cask-conditioned beers along with one super-secret draft offering: Double Dry Hopped Tippecanoe Common Ale; Killer Beans Oatmeal Stout; Dry Hopped Big Boris Barleywine and Pucker Brown, a Belgian-style sour brown ale. Don't worry, we'll also be bringing along a fire pit for those who can't handle the chill. But hey, it's a winter beer festival after all! 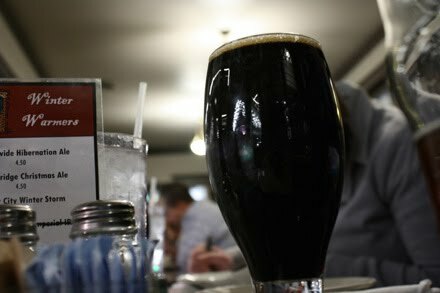 On tap this weekend at LBC: Ouiatenon Wit; Prophet's Rock Pale Ale; East Side Bitter; Pipers' Pride Scottish Ale; Tippecanoe Common Ale; Eighty-Five; Black Angus Oatmeal Stout; Snow Daze IPA; Weeping Hog IPA and the last bit of our Big Boris Barleywine. We'll also be featuring a cask of Double Dry Hopped Tippecanoe Common Ale for Firkin Thursday on 1/28. Helios Pale Ale will be on draft. Cost is $39. If you are interested in either event, please contact the host restaurants to order your tickets. Two new beers the same week! Big Hitter Barleywine, our Pro-Am collaboration with Meca brewers Keith Baute and John Showalter was tapped Monday. 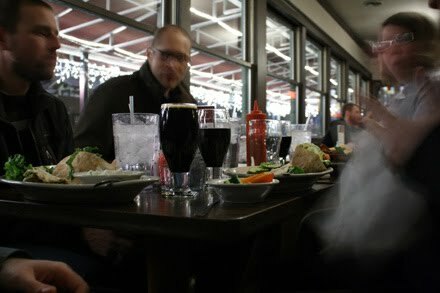 In addition, our ever-popular Nitro Stout will be on tap on Friday, 1/29. Don't miss! Our first event will be at the Upland Tasting Room. The event is a tasting and learning session for women interested in craft beer lead by women who know craft beer. Visit our blog http://girlspintout.wordpress.com/ and twitter @girlspintout for more details and upcoming events! We're kind of excited about this one. To celebrate Hoosier Beer Geek's 100th Beer Roundtable, we are inviting 45 craft beer fans who will pay $40 to join the Knights of the Beer Roundtable as we take a bus trip from Indianapolis to New Albany to eat food and drink beer. We leave from the Sun King Brewery at 135 N. College, Indianapolis at noon on Saturday, March 6, 2010. The bus will return to Indianapolis by midnight. This is going to be pretty informal, so we'll play it by ear. THIS TICKET DOES NOT INCLUDE ANY BEER AT EITHER NABC LOCATIONS. You will be required to select a lunch when purchasing your ticket. One selection per ticket. We'll also request an email address for event updates. And of course, no one under the age of 21 will be admitted. Tickets go on sale tomorrow (Friday, January 29th) at 8 AM. We hope you'll join us. Here's a link to tickets at Brown Paper Tickets. In Part 2 of our series, "Where to Drink - Great Beer, Bars, and Brewpubs in Indianapolis" (Part 1 here), we take a look at Broad Ripple Village. In 1990, it was in this Indianapolis neighborhood that John Hill started the Indiana craft beer revolution when he opened the Broad Ripple Brewpub. Twenty years later, Broad Ripple has become one of Indiana's best craft beer destinations. KOTBR #48 - Dude, Where's Chris's Car? Upland Tasting Room Now Open! My fellow Hoosier Beer Geeks, we have seen a lot of changes over the past year and there are a lot of exciting things to come. But you don’t have to take our word for it. I mean, we are just a bunch of know-nothing hacks. 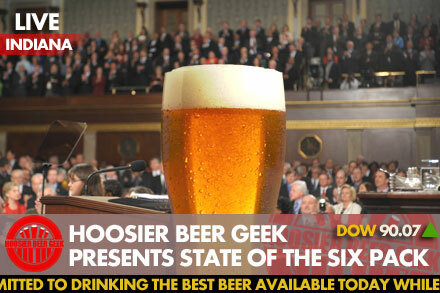 That’s why we sent a Six Pack of Questions to Indiana’s brewers, distributors, and others in the craft beer industry. And we have collected these answers and packaged them together into our second annual State of the Six Pack address. Unfortunately, Indiana lost a brewery with the closing of Warbird in Ft. Wayne. But we’ve gained six breweries: Brickworks in Hobart; People’s in Lafayette; Sun King in Indianapolis; Wilbur in Martinsville; Big Woods in Nashville; and Lil’ Charlies in Batesville. Not to mention that breweries have expanded (i.e. New Albanian, Barley Island) and there are more places than before selling craft beer in Indiana. We find it encouraging that not only is the industry growing, but is spreading out as small towns are getting breweries again. -Roger A. Baylor, Carnival Barker and Sometimes Owner, New Albanian Brewing Co., New Albany. -Charles Stanley, Marketing Operations Manager, Upland Brewing Co.
Beer sales in the United States are down. But the craft beer segment continued to grow (5% by volume and 9% by dollars according to the Brewers Association). The craft beer industry continues to grow despite a poor economy. Imagine how much the industry could have grown if the economy had improved. The sale of carryout beverages in Indiana on Sundays is like a boomerang: it just keeps coming back. Many Hoosiers apparently still hold Puritan fears of alcohol. But one aspect looks promising. Senate Bill 75 would allow the carryout of beer from microbreweries on Sundays. This would allow microbreweries to be on the same level as Indiana’s farm wineries, who have been allowed to sell their wine for carryout on Sundays. SB 75 passed the Senate 41 votes to 9. As long as no one tries to apply amendments to the bill, it looks promising that this bill could pass the House too. A couple of Congressional bills might make a positive impact on the craft beer industries. Thanks to the House Small Brewers Caucus, HR 836 and HR 4278 would reduce the excise tax paid by small breweries. It is questionable if this would have a noticeable impact on consumers and the prices paid for beer at retailers. But it would certainly have an impact on the breweries and anything that will help our favorite breweries with continued success is a good thing. Bigger and bigger hopped beers continue to be popular. We’re seeing more and more beers aged in barrels. And sour styles continue to grow. Extreme beers are always fun and are a great way for breweries to make a name for themselves. But we’re also seeing more sessionable, to-style beers coming out as well. This is good for all craft beer fans, not to mention a good gateway to bring macro-drinkers into the fold. “I also believe we're going to continue to see spice- and herb-infused brews as well as certified organic beers. [We’ll hopefully see more] estate beers. Sierra Nevada opened the door this year with the release of their Chico Estate Ale. The practice of harvesting, malting and kilning brewery-grown ingredients is sure to catch on. 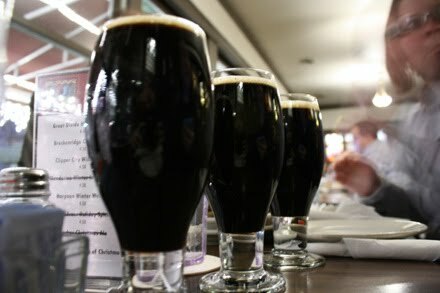 Let's also hope for a bit more recognition for quality session beers. 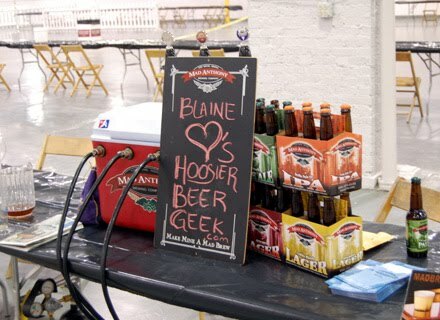 Hoosier Beer Geek will continue to be the quirky, eccentric site for craft beer nonsense. But you’ll see us organizing more beer events in and around Indianapolis and around the state. You’ll see more drinking guides that will appeal to long time Hoosiers, new residents, and visitors. And we’ll likely drink a ridiculous amount of beer. In helping put together the brewery list for Saturday's Brewers of Indiana Guild Winterfest, we reached out to a number of Indiana sister state breweries. Because of past experience, we thought it might also make sense to look to Missouri and Wisconsin and see if we could find any interest from breweries there. We were quite happy when the folks at Tyranena responded. We reviewed Tyranena's The Devil Made Me Do It! Imperial Porter back in March of 2009, giving it a very solid 4.3 mug score - so we know that the brewery is very capable. We look forward to seeing Tyranena's beer in bars and liquor stores in Indiana, and we thank Stacey for taking the time to contribute to our Six Pack series. Before we get too far… let me answer a few other frequently asked questions. How do you pronounce Tyranena? Tie•rah•nee•nah… just like it looks. Or, if it’s easier to remember, like two women’s first names: “Tyra” Banks, “Nina” Simone. And what does it mean? Tyranena is the indigenous name for Rock Lake, the body of water for which Lake Mills takes its name. (Yes, our founding fathers were incredibly creative… the lake had a rocky shore – hence Rock Lake – and there were two mills on that lake – presto, Lake Mills.) Our brewery is located just a stone’s throw from the oldest known civilization in Wisconsin at Aztalan. Tyranena is believed to be a name passed down from that ancient culture to the Native Americans that inhabited this area prior to the settlers arriving in the early 1800’s. So where is Lake Mills? Lake Mills is located between Madison and Milwaukee on I-94; about 25 minutes from the east side of Wisconsin’s capitol city and 45 minutes west of its largest metropolitan area. What does a Front Operations Manager do? When I accepted my position at Tyranena, I was the only full-time employee other than Rob Larson, our founder and brewer. It took a while for Rob to come up with my title; I think it was nearly a year before I had business cards! Basically, it boils down to a bit of a joke… There are glass doors that divide our lobby, Tasting Room and offices from the brewhaus, bottling line and warehouse. Rob says I’m in charge of everything going on in “front” of those glass doors… but basically I have my hands in everything except for brewing beer. I also try, with limited success, to stay off the bottling line, though occasionally I have to fill in or help out with special packaging. I’ve been with the brewery in various capacities for 7 years now. My servitude entails working closely with Rob (a full-time job in and of itself) as well as with our many events, staff, customers, vendors, beer geeks, distributors and the general public at-large. And since Jessie will be pouring with me at Winterfest, it’s only fair for me to out her here as well... Jessie Nimm, Tyranena’s Beer Ambassador (aka salesperson), has been slaving for the brewery for about 3-1/2 years. Her responsibilities include working with our network of distributors on pricing, promotional programs, and brand placement at the retail level. With a very strong sales and relationship-building background, Jessie has helped the brewery grow significantly. Oh and she’s a Capricorn, her favorite color is blue and her favorite style of beer is either an IPA or Porter. 2) How did you get into craft beer? Were you a craft beer drinker before you took a job working for the brewery? Actually, I was not only NOT a craft beer drinker 7 years ago when I began working at the brewery… I wasn’t even a BEER drinker. I was THAT GIRL… you know the one that says, with a wrinkled-up nose, “I don’t drink beer.” Funny how things turn out! Fact is I simply didn’t like what I knew as “beer” back then. I’d grown up thinking beer consisted of just light-bodied lagers; I had no idea of the myriad of flavors that just a few simple ingredients could create. So with that in mind, it’s fairly ironic that I started bartending part-time at Tyranena, which has a tasting room that serves nothing but beer, in January of 2003. My first day walking into the Tasting Room for training was the first time I’d ever set foot in this or any other brewery! But it was nearly love at first sight. And as such I started working every Wednesday and nearly every other day I could get behind that bar… So when it came time for Rob to hire a full-time helper, well, it was me. I’m sure that this is something Rob regrets at least five days a week but he just can’t seem to get rid of me now! Truth be told, Tyranena has a certain something about it… I felt it right away. There’s a warm kind of comfort (regardless of Rob’s personality) when you walk through our doors that you just don’t get at every “bar”. Not to mention that we are incredibly lucky to have a great group of regulars and fans, amazing customers and a great staff to boot! If ever you get a chance to swing through Lake Mills, I highly recommend it stopping by the brewery! 3) Right now you're distributing in Wisconsin, Minnesota, and Illinois - what is it about Indiana that got the brewery's interest as a possible candidate for expansion? And are you looking anywhere else? If you are looking somewhere else, is it an Indiana vs wherever else situation? Hmm… Honestly, Indiana seemed like a natural progression… We moved into Chicago last spring; it seems only fitting to creep on over toward the Hoosier state next! But really there are a lot of pieces to the decision-making puzzle. First, there should be some interest… both from consumers and from potential distributors. And, of course, we have to become amateur-experts on each state’s liquor law when we decide to make the leap across another state line. As it turns out, Indiana has reasonably uncomplicated regulations and also does not require exorbitant annual permits or fees from a brewery to distribute there. So that’s a huge plus for IN! 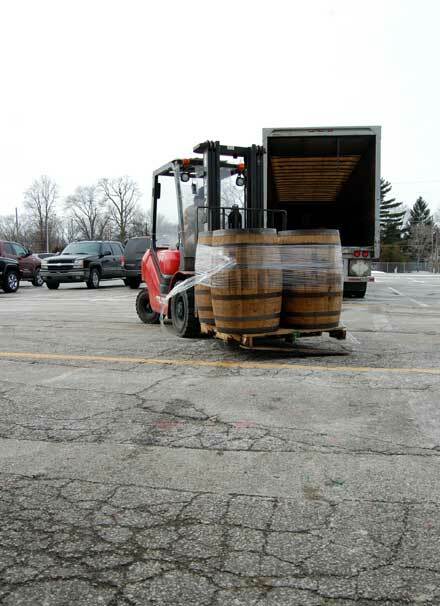 But our decision will mainly be based on finding the right fit with a distributor in the Indiana market. Most states have laws making it a real headache to transfer brands from one distributor to another. In all honesty, WE don’t want to cause that kind of upheaval in changing brands anyway. It’s better for all parties concerned that we make the right choice from the onset. We’re a small brewery. We don’t have a huge salesforce or fleet; we have a decrepit van, a burgundy toaster (aka a Honda Element) and one salesperson that currently flits between highways and airports in three states. We rely heavily on our distributors to be an extension of our business, to BE our eyes, ears, arms and legs in a market. So it’s very important that we find a connection with a distributor. We simply have to be on the same page on a variety of levels. So we do a lot of research before making any promises. And that’s where we are right now… researching. Hopefully, it’ll all work out! As far as opening distribution in other states, we have also been contemplating heading into Missouri, however, it’s not really an either-or kind of situation. When the time is right, we will take Tyranena where we feel it will be sold, consumed, marketed and appreciated appropriately! 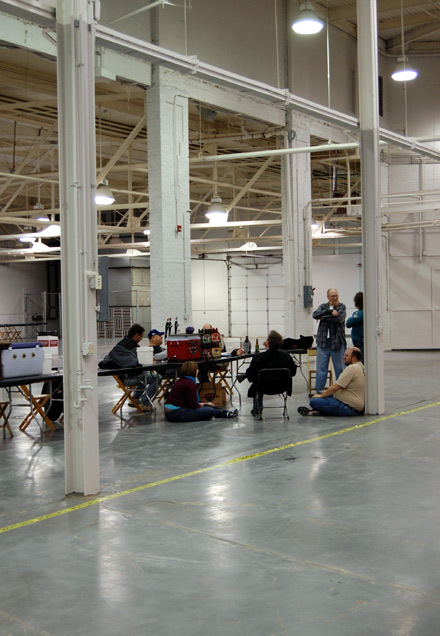 4) You have what appears to be a very nice facility - did the brewery start there? What's the history of Tyranena Brewing? Who's behind the founding of the brewery? Yup. She’s a beaut! The brewery is exactly where it has always been… same city, same location since established in 1999. Tyranena was built from the ground up to be a brewery while many of our colleagues in Wisconsin have had to retrofit their breweries into existing buildings. Not that that necessarily impedes their ability to make great beer, but it can make things more difficult to grow. We are situated on over 7-acres… plenty of room to make beer, throw a Frisbee and walk the dogs. In regards to our equipment, our brewhaus and bottling line originally came from Ambleside Brewing in Minnesota; the equipment was only about a year-old when Rob purchased and moved it to Lake Mills to start Tyranena. I guess it’s not quite as modern as it used to be… but it does the trick! As I briefly mentioned before, Rob is our founder and brewer… he is the man behind the brewery. Tyranena is his brainchild. But you can’t forget the women, dogs and new guy that work diligently for the man behind Tyranena Brewing Company… We’re pretty proud of our team. (More of a slightly dysfunctional family than a team… but…) We have just four full-time employees, including Rob. 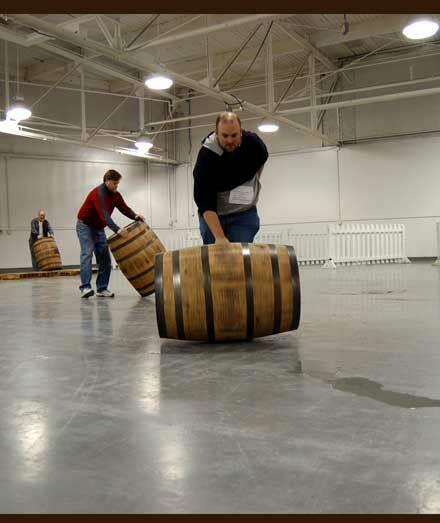 Six if you count the dogs… We all do our part to make the brewery what it is today, for better or worse! Why did Rob start the brewery, you might ask? One day back in ’97 or ’98, Rob found himself with a love of drinking good beer, passion for his homebrewing kit and, miraculously, unemployed with a chunk of capital. What to do, what to do? So in addition to earning his bachelor’s degree in chemical engineering from the UW Madison, he went on to pursue a brewer’s certificate from the Siebel Institute in Chicago and to study abroad at Brewlab in Sunderland, England. And soon after, Tyranena was born! 5) What is it about Tyranena's beers that sets them apart from other beer? Well, we believe our beers have fantastic flavor profiles, but each year-round and seasonal beer brewed at Tyranena also has a unique name specific to the history and folklore of the surrounding area or refers to something quintessentially “Wisconsin”. These legendary labels have become a trademark of our establishment and are part of the distinctive charm of our beers. Our Brewers Gone Wild! Series beers are big and geared towards aficionados. They have crazy, in-your-face flavors to match their bold and sometimes daring names. Obviously, the names also grab your attention but, in case you are wondering, they are not meant to be offensive… The first printer we worked with on these labels didn’t agree. The company actually ended up declining our business because of the names of the beers! (They really frowned upon printing “HopWhore” even though the Federal government had no problem approving the label.) We know the names are definitely out there and more extreme than anything else we've ever done. But... that's exactly the point. So are the beers. 6) Which Tyranena beer is your favorite? And does the brewery generally roll out the whole lineup (6 regular, 4 seasonal, and the Brewers Gone Wild series) when moving into a state? And what sort of timeline are you looking at? I really enjoy our porters, especially the imperial barrel-aged ones! (I’m also looking forward to the release of our new Spring seasonal, Down ‘n Dirty Chocolate Oatmeal Stout.) Who’s Your Daddy?, which was our very first Brewers Gone Wild! release, was pure magic. I have just one lonely bottle in the back of my refrigerator that I am saving for a special occasion… like when I get married… or upon the birth of my first child. That’s how great this beer is. We hope that a new distributor will take on our full lineup, including our year-round flavors, new seasonal lineup (there are now 6 flavors) and the Brewers Gone Wild beers. But that decision is ultimately made by the distributor. I imagine that they take into consideration the demand and interest for the brands when ordering so… speak up Hoosier Beer Geeks! Be sure to let your favorite liquor store and watering hole know what flavors YOU want to see in your market. It makes a difference! And lastly, in regards to a timeline for our brands hitting Indiana taps and shelves… well, all I can say is we hope sometime soon? (With a question mark, of course.) The appropriate “time” decision will ultimately be arrived at by the brewery and whoever our distributor turns out to be… assuming, of course, all parties come to terms. Then it will be a matter of when we can schedule releases, transit, marketing, product availability, license approval and a whole slew of other things. Thursday, January 28th from 5 - 8pm at Keg Liquors in Clarksville: Scott from Schlafly joins us for our January Beer Tasting. Friday, February 26th at Rich O's Public House in New Albany: Gravity Head begins! Saturday, March 6th: KOTBR100 - Stay tuned for details. Komodo Dragonfly Black IPA is hitting our shelves and taps this week. Look for it all over town, including the Upland Tasting Room while it lasts. Also Winter Warmer 22 oz. bottles are available, so keep your eyes out for them. This is the first of a few beers we will be offering in 22 oz. bottles this year. 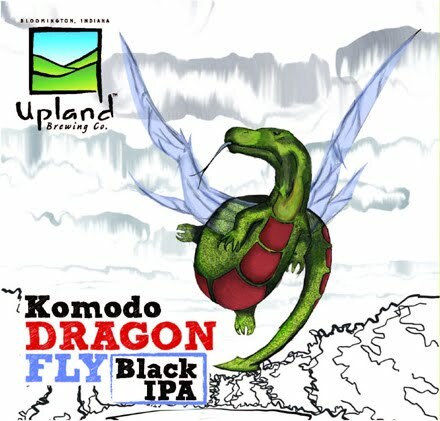 Komodo Dragonfly Black IPA will be available on draft. If you are interested in either event, please contact the host restaurants to order your tickets. Our newest seasonal, Komodo Dragonfly Black IPA is available in the Bloomington Tap Room, Indy Tasting Room, and in bars and liquor stores throughout Indiana. We'll soon have Lightwave Belgian Pale and Banshee Scotch Ale on draught in Bloomington and Indy as well. Upland lambics are returning! A small number of barrels have reached full maturity and will be released in March, through the Bloomington Tap Room only. We'll begin taking reservations sometime in February. If you want to be the first to know when reservations begin, email charles@uplandbeer.com to be added to the Upland newsletter list. The number of bottles is very limited. Granite City is tapping its McK's Scottish Ale 1/25 at the Mug Club Party. Scottys Brewhouse North Indianapolis (96th St) now offers Bell's HopSlam Ale! Come in and try one of the most sought after beers! Mad River Serious Madness: This black ale is the cure for cabin fever...not because it makes you feel like you're getting out but because it'll make you happy to stay in. Dark aromas of coffee and caramel in the nose and bitter hops and chocolate in the sip keep it rich but not cloying (or maddening). Victory Baltic Thunder: With just a little fruit behind the dark toffee flavors of this porter, thunder should be in your forecast (yeah, I just wrote that).< Schlenkerla Urbock: a German brew that's cellar aged and oak cask tapped with just a bit of smokey tang for this dark gray winter. The Brewers of Indiana Guild's Winterfest 2010 tickets are on sale now online. Ticket sales are also available at breweries across the state, including: Broad Ripple Brewpub, Brugge Brasserie, Barley Island (both locations), Upland (both locations), Rock Bottom (both locations), Ram (downtown), Alcatraz, Sun King, Oaken Barrel, Lafayette, Brickworks, Three Floyds, Back Road, Crown Brewing, Mishawaka, Half Moon, Mad Anthony (Ft. Wayne), Great Crescent, New Albanian, Turoni's Main Street, Power House, and Big Woods. They are also available at selected Crown Liquor stores. 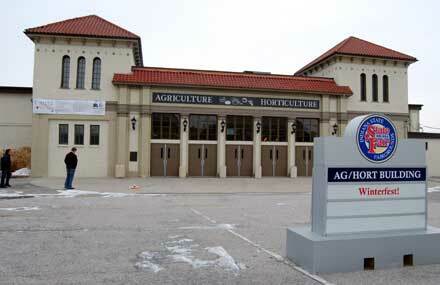 Winterfest will be held in the Ag/Hort building of the Indiana State Fairgrounds on Saturday, January 30th, 2010 from 3pm to 7pm. Tickets are $30. Over the course of the last few years we've been fortunate enough to visit many of the finer craft beer serving establishments in the city, but we've never taken the time to write a comprehensive guide to all those establishments. Despite Indianapolis' still-growing beer culture, coming up with a master list is quite a daunting task. Our goal was to come up with a drinking guide for Indiana visitors and residents alike. Though this list is not all encompassing, we feel that it's a good start for anyone looking for better beer in Indianapolis.